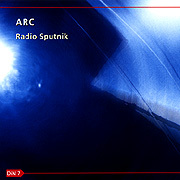 Radio Sputnik by Arc features the talents of Ian Boddy and Mark Shreeve, two of spacemusic's most prominent figures. Recorded live at the 5th Alfa-Centauri Festival, the duo presented pieces from their first release, Octane as well as some new and even more provocative realizations. Boddy and Shreeve obviously have a pre-occupation with the musical era spawned by the album "Phaedra" and the listener will be struck by the grandeur of Arc's synth detailing circa 1975. On Radio Sputnik, Arc features a plethora of weird and original electronic effects interspersed with 21st century samples of vintage electronic instruments. But what drives this album to the edge is the management of the definitive hardware of this genre (a genuine museum piece), the venerable Moog IIIc modular. The fat, detuned oscillators, the snapping of the Moog's filter as the rhythms percolate and open up, the intricate and ever-evolving polyrhythms generated by the brute's built-in analogue sequencer are endlessly fascinating. The linear musical trip builds, evolves, then recedes and shifts, ultimately winding down into a deep space improv - the tension released, only to spark and begin all over again, off to explore a different coordinate. Spacemusic fans certainly will enjoy Radio Sputnik for its evocative melodies laid over shifting sequencer patterns. But, as fanatical as this duo are about precisely delivering nostalgic and pristine sounds, rhythms and melodies, they never cease to have fun in the process. Radio Sputnik combines Arc's common heritage, their individual skills and shared vision. What comes of this is a spirited homage to early spacemusic.